I could live my life by gamification. I have always struggled to build up positive habits, or complete difficult tasks. Procrastination is the bane of all my days and without strong incentivisation, I wouldn't get much done. 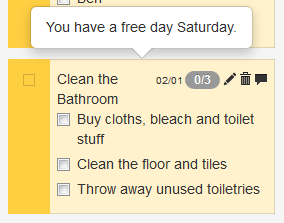 I've tried it all: to do lists, phone alarms, buddy systems, and reward schemes. Nothing really worked. For some reason I can just never stick to anything for any length of time, it is why I've found maintaining the blog so difficult. My notebooks are full of half-completed post drafts, but I can never seem to remember to maintain habits. Then recently I was turned on to HabitRPG. 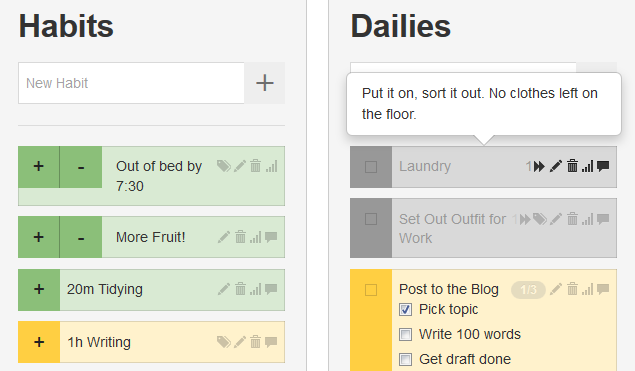 It seemed perfect, an actual website where I could set goals, make lists, and encourage habits. What is at risk? Only gold coins, fictional health and experience points. However, I am a roleplayer and these things are hugely important to me. So far I have been 'playing' for only a few days, but already I have been drinking more water and I even managed to drag myself out of bed twenty minutes before I usually do, (honestly I sleep until I absolutely have to get up and have no time for myself in the morning.) Even as I sit typing this blog post it is because the thought of losing HP needlessly is utterly abhorrent. Note the meta-checklist that I have yet to complete. It nicely breaks your day into four categories, each with a unique mechanic. The titular Habits are there to encourage a constant action or attitude. Every time you act in accordance to a habit you would like to form, you click on the appropriate + or - (depending on the habit), and each time you gain a small amount of gold and exp. Whereas Dailies are much stricter. They are things that you intend to do every day (or on specific days every week). Failure to perform these tasks will lead to a loss of health. This health loss can be mitigated through the use of checklists. Both these tasks can be ranked by difficulty to allow for a reward bonus when completed. To-Dos are there to do just that. You can make lists of jobs to be done and leave them for as long as you like, not worrying about the time limits of Dailies, nor the required repetition of Habits. For these, you can use the same check-list system, although this offers no buffer as there is no punishment for late completion. I use the lists to keep me on track. As you earn gold for your diligence it can be spent on in character items and upgrades, but also on Rewards that you can set for yourself. It gives one the feeling of a standard, hack'n'slash tabletop game, where managing resources to maximise gain is everything. By setting yourself extra Rewards, you also manage to stick to your habits. I will drink less coffee if I look forward to my 'Fancy Latte' and earn it through hard graft. 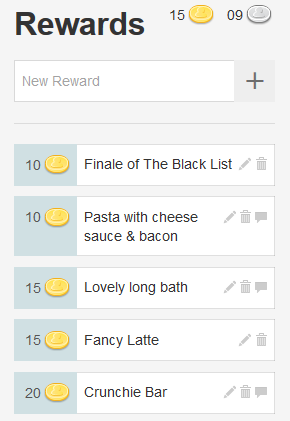 Also yes, many of my rewards are food themed. Food it excellent. So far I have not breached the dizzying heights of Level 2, but I get a little high out of the yellow bar filling with experience for every orange I eat, and blog post I write. (Which I understand is the point). So far, I think that anything that makes me genuinely want to complete a task rather than feeling nagged, then it has to be working. I look forward to leveling up, gaining equipment and creating my guild. And when I update this I will be able to tick off 'Post to the Blog'. Hurrah for self-fulfilling tasks! HabitRPG is totally free. More posts on the subject will be forthcoming. I must now post to this blog weekly, otherwise poor Grey here will die an untimely death. Something I will not let happen (I always become a tad attached to my RPG characters).